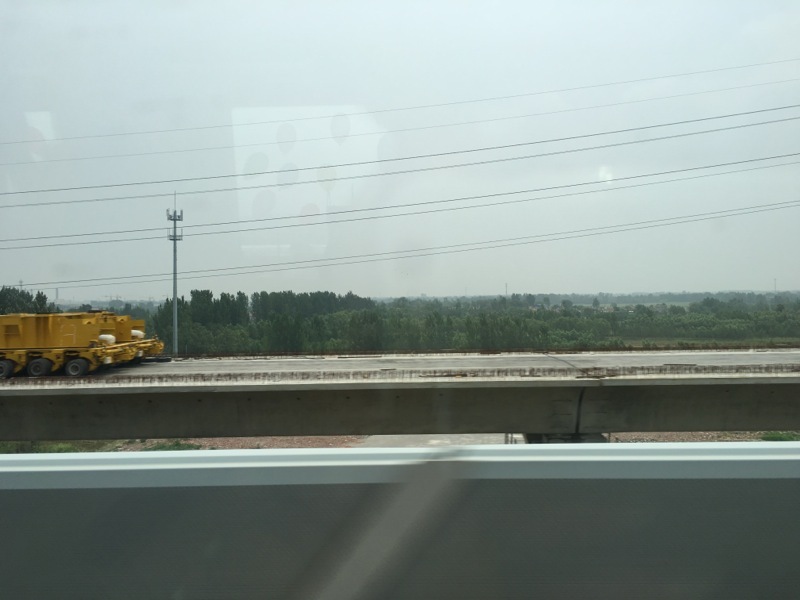 You might have seen the action if you were passing by on the Beijing-Shanghai HSR between Dezhou and Ji’nan: there’s another HSR line being built! This new line, the Shijiazhuang-Ji’nan HSR, is slightly slower (250 km/h / 157 mph instead of 350-380 km/h / 217-237 mph), has slightly more stations (around 2-3 more than the Beijing-Shanghai HSR between Dezhou and Ji’nan), but is also a complement to the national HSR network. The Shandong part of the Shijiazhuang-Ji’nan HSR comprises of the stretch from Dezhou East (Dezhoudong) through to Qihe, just around the larger Ji’nan metropolitan area, and runs parallel to the Beijing-Shanghai HSR in the Shandong part, going for just over 236 km (147½ mi). This part is currently having tracks laid. When the whole line is complete, the entire line — all 323 km (202 mi) of it — will cut travel time bewteen Shijiazhuang and Ji’nan to as little as 1 hour and 20 minutes. This new line will also form part of the west-east HSR corridor from Qingdao, eastern Shandong province, to Taiyuan, Shanxi, thus connecting Eastern China to Central China. And apparently, not only are locals excited about this — the People’s Railway Daily reports that a group of overseas students from the US, South Korea, and Africa, 50 in all, visited the site of HSR construction works. When you come to think of it, apart from South Korea, which has its own KTX network, none of the other countries has a comparable HSR network…!